Earn 249 SATVantage Rewards points with this purchase! Quality 1.65 meter prime focus dish made in Taiwan by Jonsa. Comes with self supporting stand for easy installation on any flat surface such as wood or concrete with the appropriate screws. 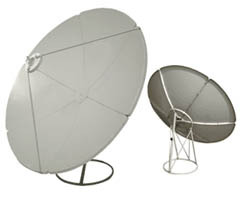 Dish is meant to be stationary on a fixed position as it does not come with a polar mount. Can be used to receive HITS TV and most C or Ku band satellites in central or southern Canada.